Horror has long been a staple of Filipino genre cinema, even in its earliest features prior to World War 2. 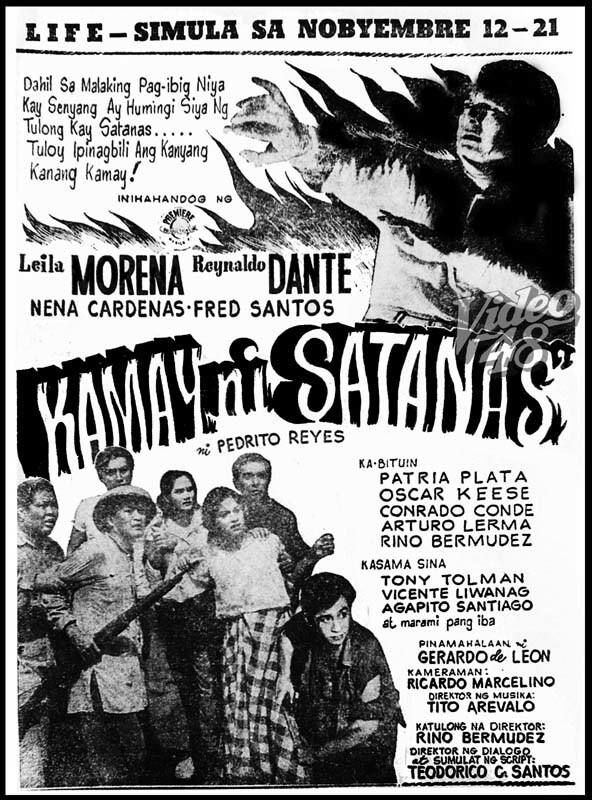 Later horror films such as Gerry de Leon’s Kamay Ni Satanas (1950) and the Faustian tale Satur (dir. 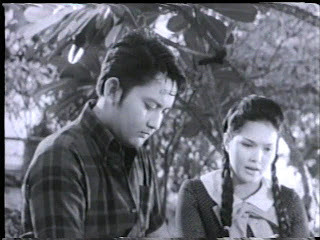 Lamberto V. Avellana, 1952) betray a ferocious Catholicism, while Ramadal (dir. 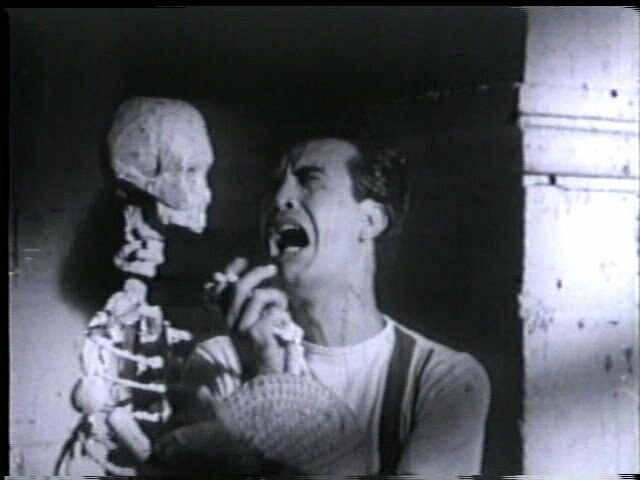 Nemesio E. Caravana, 1958) - “BEWARE! 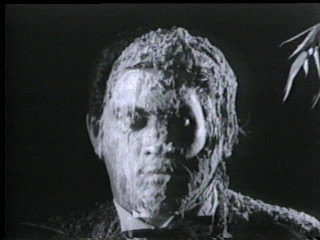 An Invisible Man is on the loose in Manila!” - is a gleeful appropriation of imported Hollywood conventions. 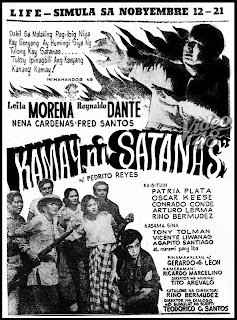 Vampire cinema in particular lends itself to the Filipino sensibility, planting itself comfortably on top of the Philippines’ rich legacy of folklore and superstition: malevolent shapeshifting Aswang, the bloodsucking Manananggal whose bodies split in two at the torso, even the tree-dwelling Tikbalang, centaurs with the head and legs of an enormous horse. 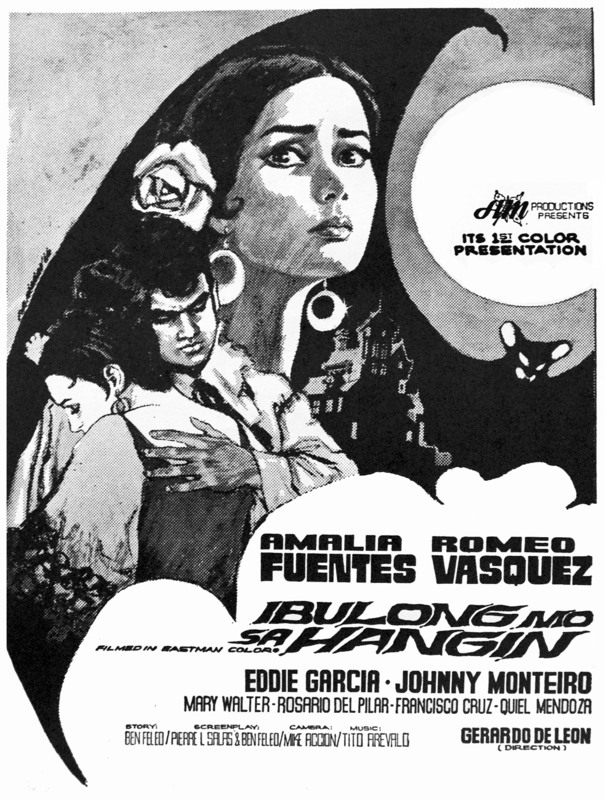 It’s strange, then, that most Pinoy vampire films from the Sixties should be of the nudge-wink variety, either in horror vehicles leavened with comedy to make them more palatable (“4 spine-chilling, rib-tickling comedy-horror thrillers!” screams the poster for the anthology film Kababalaghan O Kabulastugan), or as foils for popular comedians Dolphy, Chiquito and Pugo. As with much of the Philippines’ pre-Eighties cinema, very few vampire films from the period have survived. 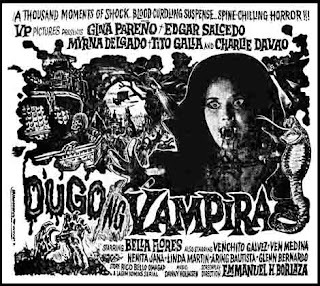 Thankfully there are two bona-fide masterpieces of Pinoy horror by Gerry de Leon…and then there’s Dugo Ng Vampira from 1969. 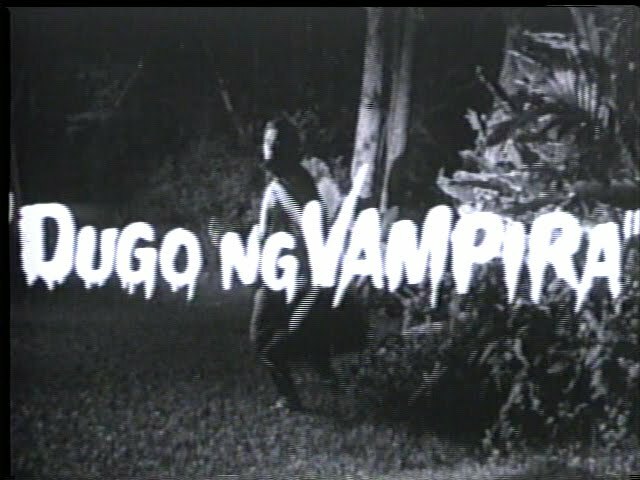 Naturally it’s unfair to sit Dugo… next to the exponentially and, by their very pedigree, superior de Leon films The Blood Drinkers (1964) and Curse Of The Vampires (1966), but comparisons are inevitable. For years Dugo Ng Vampira (translated: Blood Of The Vampire) was believed to be the Tagalog title of Curse Of The Vampires (also released in the US as Blood…), and only recently surfaced after Sampaguita transferred their remaining film library onto VHS through retailer Kabayan Central. 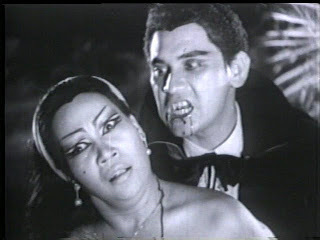 Dugo Ng Vampira is very much a product of a studio system in decline, and it shows; Vera Perez Pictures was an offshoot of Sampaguita Films which until the early Sixties was part of the Big Three’s monopoly over Filipino cinema, along with LVN Pictures, and Premiere Productions, owned by Cirio H. Santiago’s family. 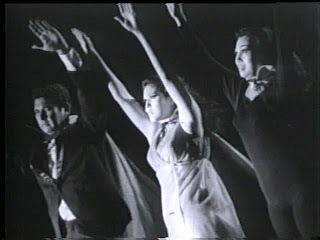 Both The Blood Drinkers and Curse Of The Vampires were constructed from the ground up as export-friendly titles, filmed in technicolour and dubbed into English using the actors’ own voices. 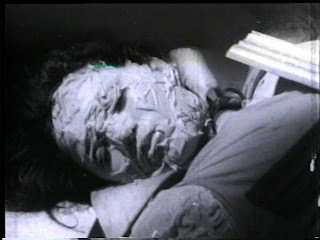 Dugo…, on the other hand, is a prime example of the local industry’s glaring limitations: patchy live sound, an unwieldy regulation 110-minute running time, a masala of melodrama and comedy based on a pre-branded komik series, and a dreadful transfer from a scratched, rat-assed black and white 35mm print. That the film still exists, however, is a miracle in itself; the fact it’s a decent populist Pinoy horror from the Sixties is, for the most part, pure cream. 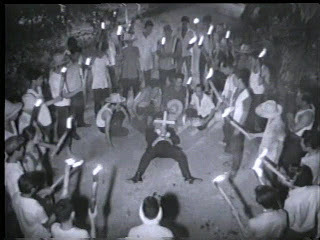 Dugo Ng Vampira’s hand-scribed credits flash over an opening that’s vintage Universal horror: the town’s landed gentleman and unrepentant vampire Angustia (Charlie Davao) has just feasted on a young female victim (Bella Flores) and is now pursued by an angry mob of torch-carrying villagers. 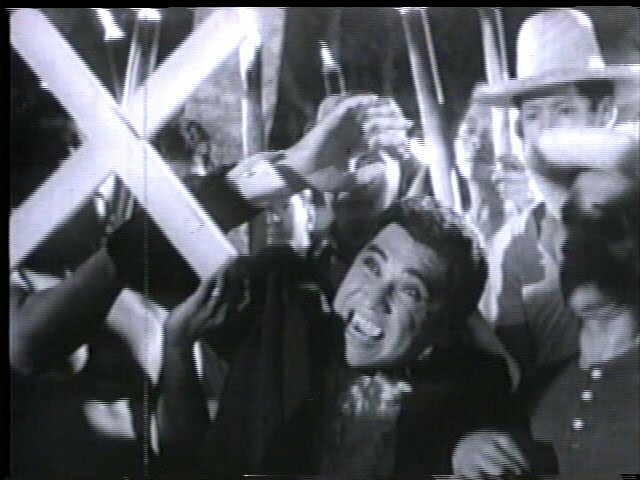 Cornered in the grounds of his villa, Angustia is staked through the heart with a sharpened cross and left to die alone in agony. 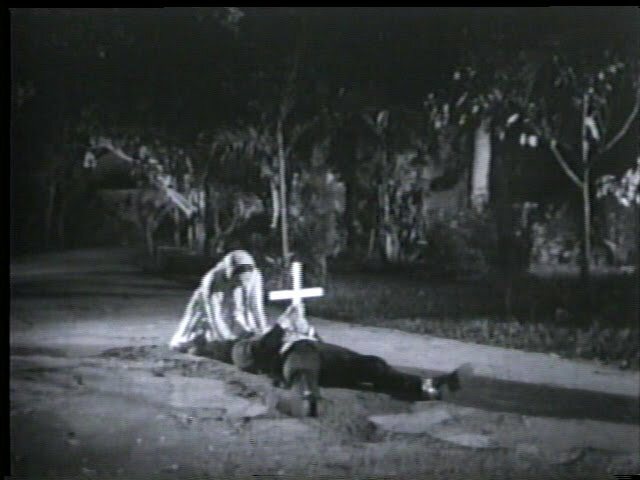 With the sound of a howling wolf in the distance, he is tended to by his distraught sweetheart (Myrna Delgado), who removes the cross and buries him underneath it. 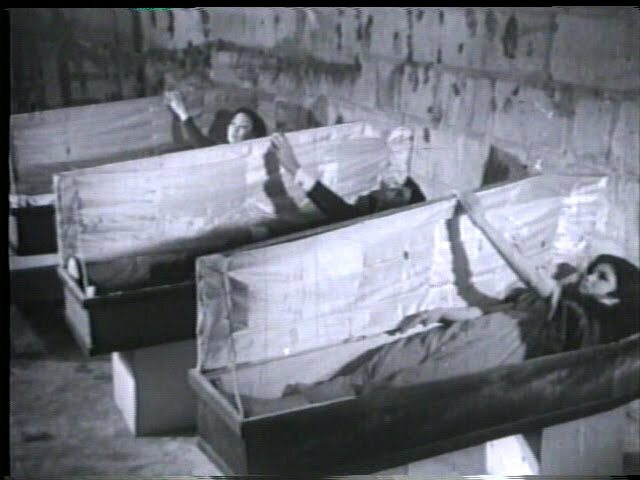 Being mortal, she is also carrying the vampire’s children – twins, one good and one inherently evil – and after her mother is thrown down her stairs by an unseen force (linked to the cobra curled around the vampire’s grave marker! 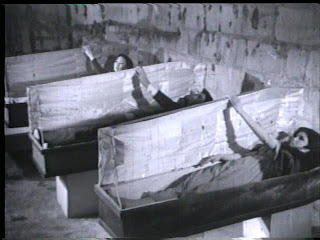 ), she leaves one of the babies, flees the village with the other child, and heads in a trance directly for the sanctuary of Angustia’s villa. A decade passes, and the mother grows suspicious of her remaining child’s true nature. She catches the girl Lucinda (Gina Alajar) in a cave talking to a cobra and bat – and the bat, a bizarre sock puppet contraption with wings, is talking back! The girl plumps up quickly into a brazen teenaged hussy (Gina Pareno), unaware of the existence of her twin sister Rosario (also Pareno, without the excessively vampish makeup, puffy hair and go-go boots). 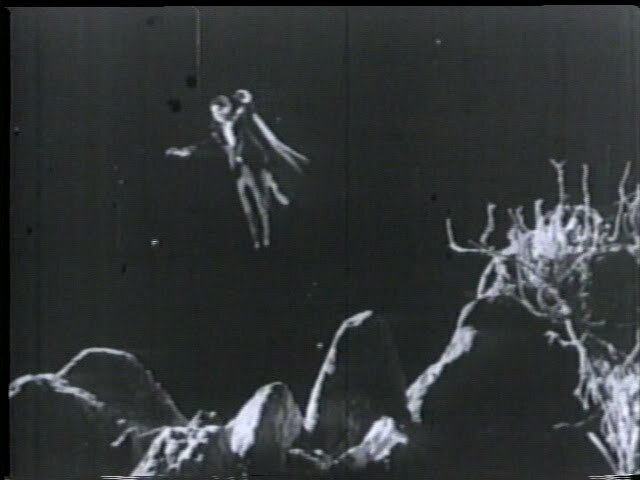 Meanwhile the mouldered corpse of their father rises out of the soil, transforms into his suave former self, then disappears in a flapping of bat wings and reappears at the villa along with his last victim, unlocked from her cobra shell. Angustia and his new bride are keen to teach Lucinda the finer points of her vampiric legacy (“We need blood,” they hiss, “HUMAN blood…”), and take her for a flying visit around the craggy countryside looking for victims. It’s here the film’s rudimentary special effects – dissolves, jump cuts, miniatures for the Villa exterior – take a quantum leap: Lucinda complains of being tired, and suddenly the cabal split into two mid-air in typical Manananggal fashion, their fanged top halves continuing to soar while the bodies gently land. A simple optical effect, and positively prehistoric by today’s standards, but crudely and eerily effective. Naturally the plaited, seminary-going Rosario is mistaken for her bloodsucking sister, and her beloved Victor (Edgar Salcedo) becomes fiercely protective of her; once the angry villagers notice she is not scared of a crucifix but the “other” Rosario is, the hunt is on for a neighbourhood vampire. (Theirs’ is only a small provincial village, so how could they miss a mother and child camped in their most notorious resident’s former hacienda? 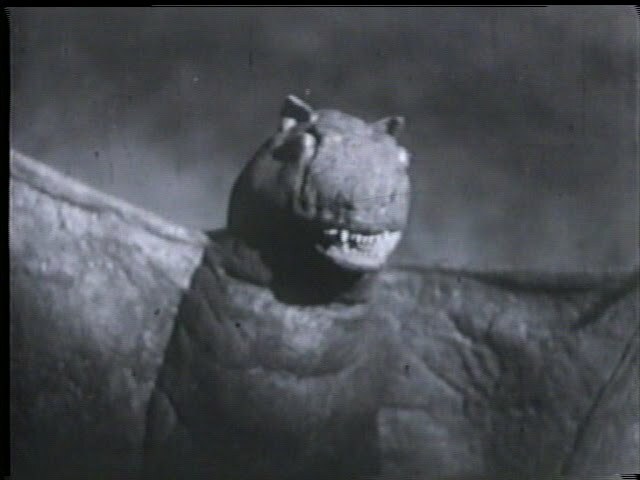 And here’s another plot hole so large you could part a hearse in it: why didn’t Angustia turn to ash at the film’s beginning? Now back to the movie proper…) Victor’s deceitful, treacherous lothario brother Rufo (Tito Galla) arrives from the city and he too has eyes for Rosario; Rufo’s plan is to trap her in his house until she falls in love with him, but then the equally duplicitous Lucinda, posing as Rosario, seduces him over to the Other Side. The scenario now brother against brother, mother against child, as both families fight to save what Goodness is left within them. More pronounced than ever is the presence of Evil – in this instance, vampirism - as a dramatic rip in the fabric of everyday, God-fearing, family-bound normalcy. The film’s core rests upon a triumvirate of dualistic relationships, one representing Good, or at the very least temporarily lost and potentially salvageable, and the other Evil: unwed mother and vampire Angustia, daughters Rosaria (Rosary, perhaps?) and Lucinda (Lucifer?) 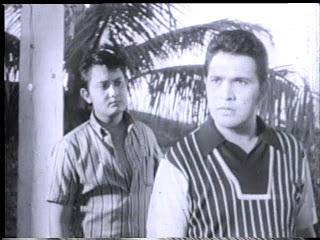 and brothers-at-war Victor and Rufo. The protracted finale sees not only Victor cornered and forced to kill his sibling (in a neat twist, with a conch shell! 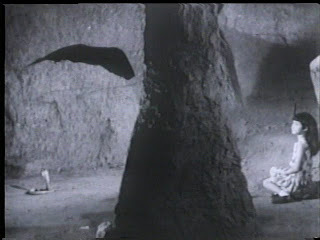 ), but the mother to sacrifice her Bad Seed – by this moment, Angustia has already impaled his jealous vampire bride on the iron rod sticking out of his chest. 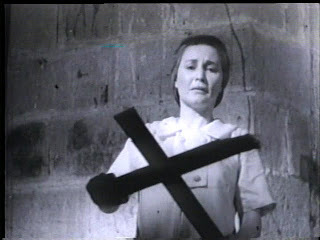 “Why didn’t you call God?” demands the mother, as Lucinda writhes under the shadow of a makeshift cross. 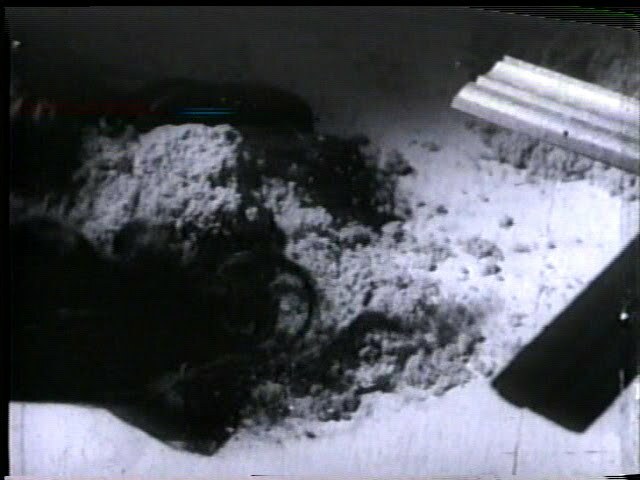 “Hope you rest in peace,” she says quietly, as Lucinda turns to ashes and is blown away by the wind. 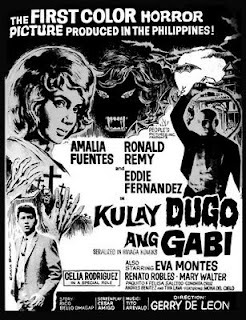 In Dugo’s intensely moral, necessarily komik page black-and-white universe, Evil is ultimately vanquished and the wayward are brought back to God’s bosom, but at a heavy price. Vampire death by conch shell. A first? At times you’d be forgiven for thinking Dugo… is a Bollywood remake of a Mexican vampire film: melodramatic, a fusion of Asian and Hispanic family-centricity, tarnished and years-weary, and entertaining in an arched, eccentric way. 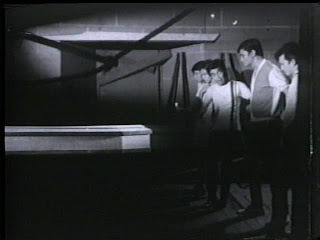 In its favour it’s not nearly as cloying and sentimental as it could be, there are no musical numbers to spoil the atmosphere, and the regulation comic relief from a mugging German Moreno – effeminate leader of a group of tourists stranded overnight at Angustia’s villa - is kept to a minimum, as is the teen soap angle (if Vilma Santos or Nora Aunor were the lead, God help us...). 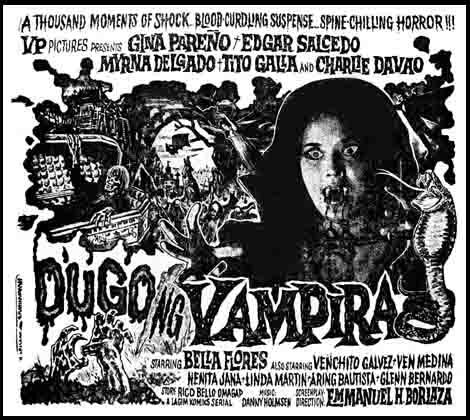 OK, so comparisons are mean, and so what if Dugo Ng Vampira is no Curse Of The Vampires? 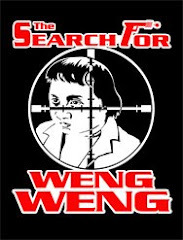 Sometimes it’s good to turn a blind eye to the Ugly Duckling’s smarter and prettier classmates and welcome them home as a lost child, sorely missed and never to be forgotten. Angustia's pregnant lover (Myrna Delgado) buries him with dignity...the FOOL! Angustia flying over the "countryside"
...and German Moreno (centre) can't believe his eyes! 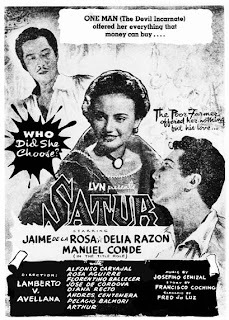 galing ng blog site na ito...madami akong natututunan pag dating sa evolution ng Pelikulang Pilipino. 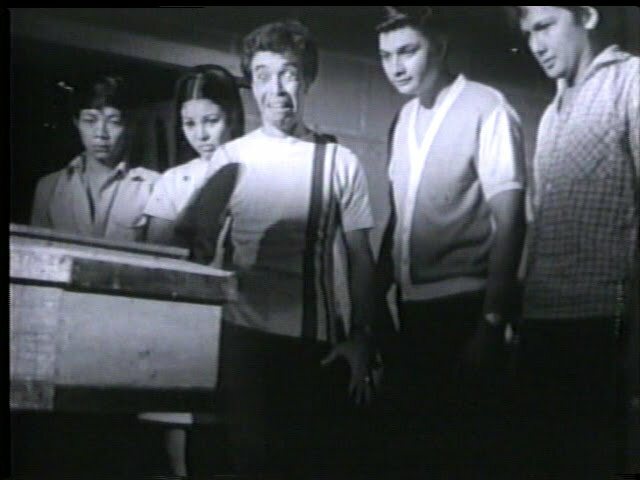 Mabuhay ka!